Exorcisms still exist in modern society and demonic possessions appear to actually be on the rise, with more and more people claiming possession as an explanation for their various illnesses. Coinciding with this is the ever growing popularity of films that deal with exorcisms, possessions, and haunting; such as Insidious, The Conjuring, Paranormal Activity, and Deliver Us from Evil. This doesn’t even include the countless other indie films that cover the same subject matter, along with numerous documentaries such as The Exorcist in the 21st Century. 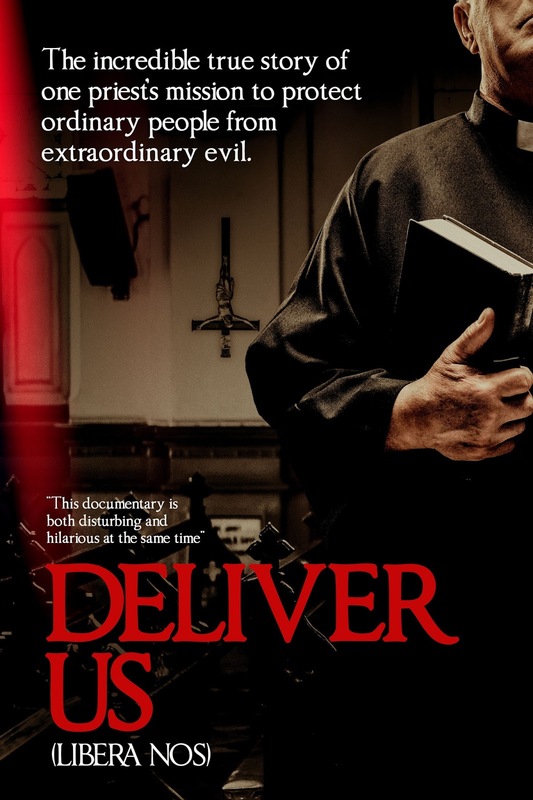 Deliver Us AKA Libera Nos is a new Italian documentary that showcases one of the most sought after exorcists in Italy, Father Cataldo, while also shedding light on the realities of modern day Catholic exorcists. Horror fans have come to expect exorcisms to be truly terrifying, what they will discover while watching this is that they are usually rather boring. The movies are a true spectacle of the senses, combining acting, sound effects, a score, lighting, and special effects to create something that is both entertaining and frightening. You won’t find that here, only some screams, spitting, cursing, and cat noises from the possessed individuals. Unfortunately, this documentary suffers from being rather dull and is a laborious task to complete. I honestly only continued watching it to find out what conclusions would be made at the end. There are questions raised and some unsettling issues that are witnessed, but I don’t think that they are ever completely delved into and answered. Father Cataldo is an Italian priest in the Sicilian city of Palerma, who holds a large mass of liberation every Tuesday. He is extremely popular and is constantly in demand, with his popularity nearing a sort of rock star status or that of an overbooked doctor. Not only does he perform these mass exorcisms, but we also see him conduct individual, private sessions, and even phone exorcisms. The documentary mostly focuses on Cataldo as he tries to help his afflicted followers. The filmmakers also focused on three of the possessed individuals, following them in their day-to-day lives. The disturbing aspect of Deliver Us isn’t that these people are suffering from demonic possession; it’s whether they have unexplained psychological issues or some other illnesses that are being misdiagnosed and mistreated. Or, some may be seeking attention through their unusual behavior. One thing is for certain, the potentially possessed only displayed these wild behaviors while inside of a church or when religious acts were being performed on them. They also didn’t perform any violent acts upon the priests and the people assisting him. These are questions that could’ve have been addressed, but the filmmaking style was to simply observe and film what was occurring. This noninterference is a major weakness of the film, because there are so many questions left to be asked. Out now in select theaters and VOD, Deliver Us is a hard one to gauge potential viewer interest. If you’re a fan of horror and possession films, you’ll most likely be largely bored by its lack of fright. If you want to witness the plight of people with psychological issues and the exploitation of them by the Catholic Church, then this may interest you. Share or risk being possessed.